BY year end, two realities in respect to the Jeep Compass will have surely realised. The first is that ‘big’ is set to move aside for ‘baby’ – that is, this new model will have bumped into second spot the Grand Cherokee that has led this brand’s local sales charge here forever. That overthrow is an easy one for distributor Ateco Automotive to call. SUVs are hot, but the compact sector into which this model has introduced is in highly fizzy state. Compass-sized models claimed a giant-sized pie slice last year, with 25,000 sales. The second reality also has to do with market condition. Even though the Compass is designated the baby Grand, the version likely to sell strongest will be the one least likely to follow in the big gun’s tyre tracks when the seal runs out. Ateco admits the entry Longitude, as the sole front-drive in the Compass family, doesn’t conform as neatly to Jeep’s rough, tough, go-anywhere image the four-wheel-drive Limited and Trailhawk editions. Yet it’s just a fact of life it had to be built and provisioned here. Simply because so many SUVs buyers these days zero in on aspects of status rather than actual sludge-ability. It’s all about the ‘look, right? Except, to Jeep, it isn’t. Off-street cred counts with a dirt-encrusted jewel of the Fiat-Chrysler empire whose fighting spirit was born on the battlefields of Dubbya-Dubbya-Deuce. It’s happy enough to win over in the streets, but the brand message is that every Jeep secretly yearns to be let at the Rubicon Trail, the famous California track that must be conquered as part of the sign-off process for every four-wheel-drive it builds. With Compass then, the show must go on. That’s why Jeep New Zealand has determined to promote this car with a travelling roadshow that includes an artificial off-roading course; so that townies can test the outdoorsy adventure skills without having to leave the city. The set-up is purely for the all-paw product, but the invite to enjoy it extends to all potential Compass customers, including those who settle on the one so wussy it is not even recommended for towing (the AWDs can haul 1000kg braked). The Longitude’s limitations on natural terrain would surely have been cruelly exposed by today’s media drive. Jeep New Zealand organised a drive that saw the Compass driven over a variety of main and secondary sealed roads north of Auckland but was conceived foremost to allow it time in a recognised off-road playground, the Woodhill Forest. We had a great old time tackling, and taming, some well-rutted tracks undulating through the trees. Having the range-topping Trailhawk as the trailblazer was logical. A model whose name signals that it has a Rubicon pass mark has the most advanced four-wheel-drive, with a superior diff lock and also a downhill descent not meted the cheaper cars, plus superior suspension travel plus a more generous 225mm ride height. Even though it scuffed its belly more frequently, everywhere the family battlewagon went, the Limited had no problem following, even when cocking a wheel (a trait that reminds that ultimately, the MacPherson front and Chapman strut rear set-up hasn’t the ultimate pliancy of larger Jeeps’ suspensions). Which was just as well, given that was what I’d driven all the way from Jeep NZ HQ into the deepest part of the forest. I then swapped to a Trailhawk for the rest of the day’s driving which, once clear of the forest, took in some challenging roads to Matakhana, then back to Auckland, all of which left impression that the model designed to acquit best in the rough is a bit less enjoyable on the smooth. It has a touch more body movement and also seems to ride more busily; enough to remind that the ‘sport’ part of SUV shouldn’t be taken too seriously in respect to driving trait. The chittering ride might be down to tyres. Trailhawk runs on 225/50 R17s whereas Limiteds have 225/55 R18 fare. The off-road grip was negligible where we went but, on seal, the bigger rubber is quieter. There are also looks to consider; the 18s still look small on a vehicle with such pronounced wheelarches, yet a Limited is less toy-like than the Trailhawk. You’ll notice there’s no comment about how the Longitude went there. That’s because it didn’t, for a very good reason. It’s not actually here yet. The first shipment is en route from the factory which, by the way, isn’t in the United States. Jeep is a global brand. Compass makes history by being its first model entirely built outside of the United States. Donald Trump will doubtless be incensed, but this all-American brand is delighted with Compass being the first vehicle out of new US$280 million plant in Ranjangaon, India. Speaking of happiness, Jeep New Zealand is delighted it is back on track after a lull that saw it rate as one of the few major distributors to sell fewer new vehicles in 2017 than the year previous. Now it is coming back strong: First quarter sales are 60 percent up on the past year. How long will it take Compass to beat the 600-or-so unit count that Grand Cherokee achieved in 2017? Jeep NZ can only blame itself for this. It set up a juicy inducement programme, after all. Officially, pricing kicks off at $39,990 for the Longitude, rises to $46,990 for the Limited and peaks at $54,990 for the Trailhawk. But, to push up interest, those stickers are reduced until June 30; by $3000 in respect to the entry and mid-grade and by $5000 for the flagship. 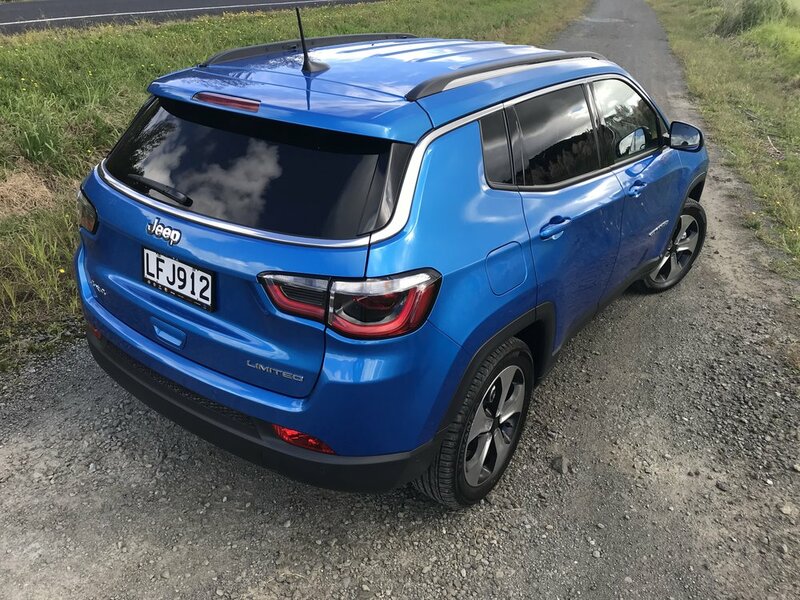 Jeep NZ has kept things simple with Compass. There’s just one engine – a 2.4 petrol Tigershark that marries to a six-speed automatic in the Limited and a nine-speed in the others, either way producing 129kW and 229Nm. Cited optimal fuel economies are 7.9 litres per 100km for Limited and 9.7 for the all-paws. Commendably, Jeep confesses to having benchmarked against the likes of the Hyundai Tucson, Kia Sportage, Toyota RAV4 and Volkswagen Tiguan. That shows in the quality of the interior fitout – some cheap plastics, still, but overall pleasant, spacious and comfortable – and the kit content. It’s more complete on the safety side in this market than in some other countries. Jeep NZ determined to implement autonomous emergency braking (AEB), lane departure warning, blind spot monitoring and rear cross-traffic alert as standard fare. AEB was key to the car acquiring a five-star safety rating from the Australasian New Car Assessment Programme. The Longitude has 17-inch wheels, a reversing camera, seven airbags, a leather-wrapped steering wheel, a 3.5-inch instrument cluster display, a six-speaker sound system, digital radio, an electric park brake a five inch Uconnect touchscreen infotainment display with Bluetooth and audio streaming, roof rails, automatic headlights and wipers, LED interior lighting, foglights and window-surround detailing. The Limited gains Jeep’s Selec-Terrain all-wheel-drive system with sand, mud, snow and auto settings. It adds in bi-Xenon headlights, LED tail-lights, front and rear parking sensors, power adjustable and heated front seats and takes a nine-speaker Beats audio system. Also implemented are sat-nav, Apple CarPlay and Android Auto compatibility, heated front seats, dual-zone climate control and push button start. Trailhawk matches Limited’s features and adds in leather (though the seat bases remain cloth) with power-operation and floor and cargo area mats. It also delivers raised suspension and ride height, extra underbody protection, that Active Drive Low four-vy-four system, Rock driving mode, greater approach and departure angles and hill descent control. You can also pick the Limited by it having a slightly different front and rear fascia, plus the bonnet has a black ‘anti-glare’ decal on it. There’s one other Compass that hasn’t had a mention. It’s the previous one, launched in 2007 and back then one of Jeep’s first tentative steps away from the cuboid Cherokee and pseudo-military Wrangler on which it had built its reputation. It was a landmark model best forgotten; everything about it was awful. So bad that, while it remained in production until the new one was good to go, our country bid it farewell three years ago. There was no ceremony. 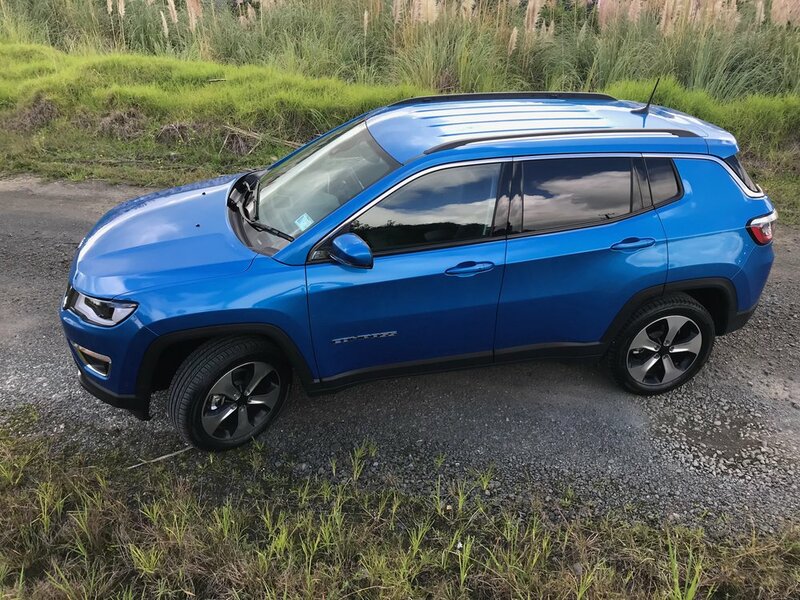 Smitherman reckons there will, of course, be owners of the old model who will naturally want to trade in for a new car that is a lot more compelling to drive and, because it has the seven-hole grille and the trapezoidal wheel arches that make a Jeep a Jeep, more like one of the family. However, thought is that the main interest will come out of people who will be shifting from other like-sized SUVs who are perhaps looking for a greater dollop of off-road competence. Unless, of course, they’re settling on the base car. Then, it’s all about the image.